Applications include geothermal, shallow oil & gas, blast hole, water well, environmental, exploration, construction. Reversible hardended wear sleeve for optimum wear resistance even in the most abrasive conditions. The Mincon MC55 is a superior but versatile hammer, specifically built for drilling applications where high penetration speeds are vitally important. It's unique design concept provides much greater impact energy and ultimate drilling performance for absolute maximum productivity in almost all ground conditions. Like all Mincon DTH hammers, the Mincon MC40 maintains an excellent operating pressure over an extended service life and overall is the tool you require to get the maximum out of all your equipment. Mincon products are all manufactured in house (Ireland) and all processes are carried out under the one roof. This guarantees that the quality you expect is always delivered. The Mincon 5DH is an excellent deep hole hammer that stands up to the rugged tests that are thrown at it. It is a field proven technology that delivers superior penetration rates versus other manufacturers. Like all Mincon DTH hammers, the Mincon 5DH maintains an excellent operating pressure over an extended service life and overall is the tool you require to get the maximum out of all your equipment. Mincon products are all manufactured in house (Ireland) and all processes are carried out under the one roof. This guarantees that the quality you expect is always delivered. The Mincon MP50 is a universal hammer that can be used in almost any drilling application. It is a field proven technology that delivers superior penetration rates versus other manufacturers. Like all Mincon DTH hammers, the Mincon MP50 maintains an excellent operating pressure over an extended service life and overall is the tool you require to get the maximum out of all your equipment. Mincon products are all manufactured in house (Ireland) and all processes are carried out under the one roof. This guarantees that the quality you expect is always delivered. Reversible hardened wear sleeve for optimum wear resistance even in the most abrasive conditions. The Mincon MP55SD5 is a universal hammer that can be used in almost any drilling application. It is a field proven technolgy that delivers superior penetration rates versus other manufacturers. Like all Mincon DTH hammers, the Mincon MP55SD5 maintains an excellent operating pressure over an extended service life and overall is the tool you require to get the maximum out of all your equipment. Mincon products are all manufactured in house (Ireland) and all processes are carried out under the one roof. This guarantees that the quality you expect is always delivered. 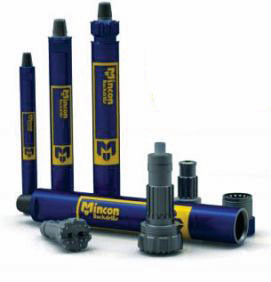 The Mincon 55BH is a universal hammer that can be used in almost any drilling application. It is a field proven technology that delivers superior penetration rates versus other manufacturers. Like all Mincon DTH hammers, the Mincon 55BH maintains an excellent operating pressure over an extended service life and overall is the tool you require to get the maximum out of all your equipment. Mincon products are all manufactured in house (Ireland) and all processes are carried out under the one roof. This guarantees that the quality you expect is always delivered. TheMincon MP55 is a universal hammer that can be used in almost any drilling application. It is a field proven technology that delivers superior penetration rates versus other manufacturers. Like all Mincon DTH hammers, the Mincon MP55 maintains an excellent operating pressure over an extended service life and overall is the tool you require to get the maximum out of all your equipment. Mincon products are all manufactured in house (Ireland) and all processes are carried out under the one roof. This guarantees that the quality you expect is always delivered.